Figure 22-3. Tissue microdissection. Note that multiple sites have been carefully microdissected according to histopathologic features. Based on the cellular morphologic features,the very best samples are collected for mutation determination. The tumor has been microdissected at multiple locations to best understand intratumoral heterogeneity. This approach is capable of delineating the temporal sequence of mutation acquisition. have identifiable TP53 point mutations and that overlapping syndromes involving related genes may account for a subset of TP53-like effects, a thorough analysis of the gene for mutations becomes important in the diagnostic workup. Recently, a number of uncommon TP53 mutations have been reported targeting the 5' nontranslated region, intron 1 promoter regions, and other sites not directly responsible for coding of amino acids.49-51 This has led to the use of ancillary tests in addition to DNA sequence analysis to better identify TP53 mutations. The gold standard for TP53 mutation detection centers on determination of precise DNA sequence changes throughout the gene (Figure 22-1). The most commonly used method to achieve this goal is sequencing of PCR products from the coding portion of the gene. When applied to DNA extracted from fresh specimens in the form of fluid, blood, cells, or tissue samples, this can be carried out using a relatively small number of individual nucleic acid amplification reactions followed by sequencing using automated high-throughput equipment. The result is a timely, reliable, and detailed sequencing of the gene at relatively low cost and effort. Under these conditions, either DNA or RNA can be collected in abundant amounts to serve as starting material for DNA sequencing.52,53 The availability of chip-based approaches using sequencing by hybridization also can rapidly deliver reliable results.52,53,54 While the latter technique is highly specialized and not as widely available, submission of specimens for referral lab oratory testing can be accomplished saving the user the effort needed to develop these assays. As indicated above, a negative result for TP53 mutations does not completely exclude the possibility of structural damage to the gene. Regions of the gene not analyzed by the specific testing method may be affected. Alternatively, associated proteins linked closely to TP53 function may be mutated. The significance of these changes will increase as our understanding of TP53 and its interaction with other cellular proteins is better understood. The use of fixative-treated cancer tissue, rather than fresh or frozen tissue, for TP53 mutation analysis is challenging (Figure 22-3). Such specimens often are the only available tissue on which a diagnosis of LFS can be confirmed. Alternatively, one may be searching for TP53 point mutations on a fixative-treated cancer specimen for the purpose of characterizing tumor biological aggressiveness or establishing relatedness to other sites of cancer formation. Solid tumor tissue specimens typically are complex in topographic cellular heterogeneity. Careful, detailed histologic study is required as a preliminary step to identify important sites for mutational analysis (Figure 22-3). Careful attention must be given to the microscopic appearance of the specimen to focus the TP53 mutation analysis on the most representative lesional sites. 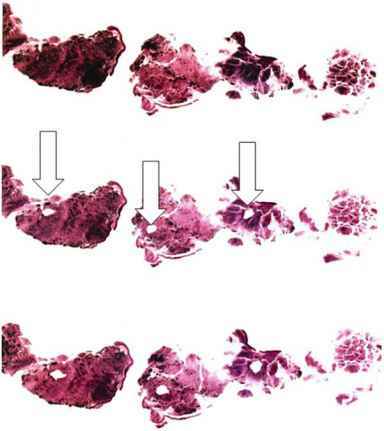 The specimen itself may be small in size, as in the form of a biopsy specimen (Figure 22-3). Thus, the desired cells for analysis will need to be carefully microdissected free of surrounding normal supporting cells containing wild-type TP53. Inclusion of supporting cells will dilute the potentially mutated cell population and interfere with the ability to detect somatically acquired TP53 mutations. Figure 22-4. 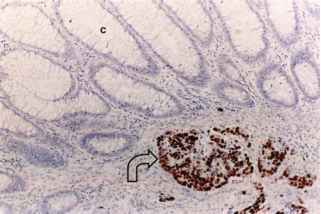 Immunohistochemistry for detection of TP53 protein. The longer stability and half-life of mutant TP53 protein lead to its collection in the cells and capacity for detection by immunohistochemistry (arrow). While immunohistochemical detection is sensitive and affords slide-based microscopic analysis, significant false-positive and false-negative detection is typically encountered, limiting the effectiveness of this approach. DNA analysis is used to validate immunohistochemical results. simple and highly affordable means to infer the presence of TP53 mutations. This approach must be used cautiously as both false-positive and false-negative staining can be encountered (see Quality Control and Laboratory Issues below). As is true for many tumor suppressor genes, TP53 undergoes a two-step process of mutation followed by loss of the residual unaffected allele, culminating in complete absence of effective wild-type protein in tumor cells.1-5 The second step of allelic loss tends to encompass the entire normal allele and in so doing also results in the loss of genomic DNA adjacent to the gene itself.6-8 Simple and sensitive methods, unrelated to direct sequence analysis, exist to detect this second event. These methods are based on DNA polymorphisms that are abundant throughout the genome in the form of single nucleotide polymorphisms (SNPs) or microsatellite tandem repeat polymorphisms (Figure 22-2). Given the interest in TP53 as a preeminent tumor suppressor gene, a detailed understanding of polymorphisms in the region of TP53, both intragenic as well as outside the gene, exist that can be used in the design of allelic imbalance analysis. Most important, allelic loss infers the presence of point mutation damage irrespective of the precise location of the initial point mutation event. This is most advantageous since it provides an independent technique to assay for the presence of mutational change and is not limited by uncommon positioning of point mutations. An example of TP53 allelic loss from microdissected tissue targeting tetranucleotide repeat polymorphisms located in close proximity to TP53 as well as other genes is shown in Figure 22-2 and Table 22-1.56 This approach, employing microsatellites, is especially appealing because it requires only a small amount of DNA per reaction and uses a short amplicon length for quantitative assessment of the desired tandem repeat. As such, it is ideal for testing of microdissected, small, fixative-treated tissue samples (Figure 22-3). Theoretically, microsatellite analysis of nonneoplastic tissue should yield polymorphic microsatellite amplicons that are equal to each other in amount. In practice, such a perfect relationship between amplified polymorphic alleles is not usually attainable. The reasons for lack of exactly balanced allelic content in nonneoplastic tissue are manifold but center on variations secondary to tissue-sectioning effects and slight differences in initial PCR amplifiability of individual alleles in any given tissue section, as well as differences in PCR efficiency in amplifying alleles of different size. This in turn entails defining thresholds for significant allelic imbalance beyond which definitive allelic loss is confidently predicted to exist (Figure 22-5). The threshold we have conservatively chosen utilizes an allele ratio of below 0.5 or above 2.00, which would correspond to the presence of a minimum of 50% mutated tumor cells in a given microdissected tissue sample (Figure 22-5). Figure 22-5. Allelic imbalance analysis for determination of loss of heterozygosity (LOH). The ratio of peak heights of polymorphic microsatellites is calculated and compared to a database of values representing the range of values for nonneoplastic samples in the general population. Peak height ratios falling outside 95% confidence limits represent true imbalance. DNA samples, one from nonneoplastic and the other from neoplastic microdissected tissue samples. The reactions are electrophoresed, and the height of each amplicon peak from each allele is quantified. Nonneoplastic microdissected tissue samples are first analyzed to determine whether each specific locus is informative, that is, whether the locus is heterozygous (Figure 22-2), and therefore useful for analysis in the neoplastic tissue. When a particular microsatellite marker in a nonneoplastic tissue sample is homozygous and manifests only a single peak, the patient is designated as noninformative for that marker. For informative heterozygous microsatellite markers, the ratio of the two alleles from the neoplastic tissue DNA is analyzed. The two alleles are in balance when the ratio of the individual allele peak heights falls within the range of 0.66 to 1.50. Values beyond this range are classified as demonstrating allelic imbalance, recognizing the following two categories. Low-level allelic imbalance is said to exist when the microsatellite allelic peak height ratios fall into the range 0.50 to 0.66 or 1.50 to 2.00. High-level allelic imbalance is said to be present when the allele ratios fall below 0.50 or above 2.00. 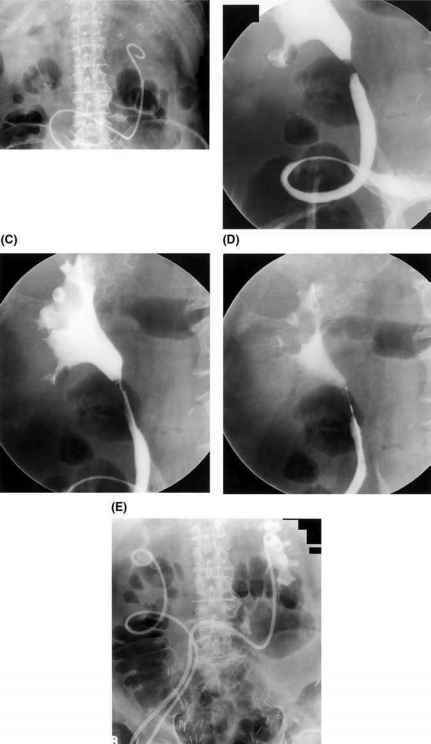 To afford a conservative assessment for the presence of allelic loss, only high-level allelic loss is classified at this time as indicative of mutation. Using these criteria, it would be necessary for at least 50% of the cells in any given microdissection target to be mutated to detect allelic loss. These stringent conditions are justified given the ability of tissue microdissection to optimally sample tumor at a particular site coupled with the desire not to overcall mutational change that may, in fact, not be present (Figure 22-5). In selected instances, most often due to small specimen size, nonneoplastic tissue may not be available. Recourse to nonneoplastic tissue can be sought in other tissue specimens from the same procedure, prior specimens, or resid ual blood samples from the patient. In a small number of cases, when even these measures do not provide nonneoplastic tissue, allelic imbalance can still proceed using tissue containing a significant admixture of nonneoplastic cellular elements apparent on histologic examination. Such samples reliably provide sufficient content of polymorphic alleles, albeit imbalanced, to ensure accurate determination of polymorphic marker informativeness. In the few instances when even these criteria cannot be satisfied, microsatellites in the form of single peaks are designated as being noninformative so that allelic loss will not be over-called. These considerations allow even the smallest of fixed biopsy specimens to be suitable for TP53 allelic loss testing. Having established the presence of allelic imbalance based on polymorphic allele ratios as described above, the microdissected sample then is designated as positive for loss of heterozygosity (LOH) for the particular microsatellite marker (Table 22-1). In addition, the specific deleted allele is denoted by the designation as either "S" or "L," depending upon whether the shorter or the longer allele is relatively diminished in content in a particular patient. This is important because the presence of the identical deleted alleles in different microdissected DNA samples from the different tumor specimens supports the existence of the same deletion in all sites of tumor. Similarly, it is possible to identify two separate mutations of the same genomic region in different topographic tissue samples when deleted alleles are shown to be discordant (Table 22-1). A similar approach can be applied to SNPs, which have the decided advantage of greater abundance throughout the genome. Many well-documented SNPs have been reported within the TP53 gene.27 There is, however, a significant disadvantage to the use of SNPs over microsatellites when performing allelic imbalance determination of the type described above. Most microsatellites manifest a high heterozygosity rate within the human population, typically greater than 75%. Thus, more than 75% of patient analyses may be expected to yield cogent information on the presence or absence of TP53 allelic loss and by consequence TP53 mutational change using microsatellite analysis. In contrast, SNPs show a far more limited degree of heterozy-gosity among humans, with the availability of only two alleles for a given polymorphic base. Polymorphic rates for SNPs are on the order of 20% to 30%, and thus most subjects will prove noninformative with respect to allelic imbalance analysis for a particular SNP. This can be compensated to a degree by extending the genotyping to additional markers; however, this may quickly exhaust the available microdissected tissue for a given case while at the same time increasing the overall effort and cost. The use of two or at most three microsatellite markers within or in close proximity to TP53 is sufficient to confidently determine allelic imbalance, usually in a replicate fashion, and is therefore ideally suited for minute microdissected fixed-tissue samples. The same cannot be said for TP53-associated SNPs, for which the use of three separate SNP markers may not prove informative in all patient samples. A useful potential application of allelic loss analysis as described above is for positive detection of LFS due to TP53 mutational damage. As stated earlier, even classic forms of LFS will, in a small proportion of patients, fail to indicate the presence of a constitutional germline mutation. In these patients and in subjects with inadequate family histories or patients described as LFL syndromes, the question of TP53 mutational change becomes very important. The mutational status of TP53 becomes an essential question to address as completely as possible. If there truly is no mutation of TP53, efforts can be redirected to muta-tional assessment of other candidate genes. When no TP53 mutation is identified, there remains a concern that the TP53 mutation may have been missed for an individual patient. Allelic imbalance determination can assist in this problematic area. If a germline allelic loss is present, then each individual neoplasm associated with that constitutional alteration will manifest the same pattern of allelic loss for TP53. The approach relies on the two-step process of tumor suppressor gene loss interrogating multiple independent neoplasms for identity, or concordance, in the pattern of allelic loss. For this testing to be operative, there must be multiple independent primary tumors that have proceeded through the two-step process with allelic loss. Multiple tumors may come from a single patient either as synchronous or metachronous neoplasms, or multiple tumors may be gathered from several affected family members. The greater the number of independent tumors showing the same pattern of allelic loss, the more confident is the conclusion that the patient or family has a germline TP53 allelic loss. When allelic loss for microsatellite markers situated in proximity to TP53 is found to be discordant—that is, different alleles are lost in different tumors—germline allelic loss is not favored. This approach based on searching for concordance versus discordance in the allelic loss pattern across different tumors provides indirect information concerning the presence of inherited germline alterations for tumor suppressor gene mutations such as TP53 in LFS.